These sausage cheese biscuits are so good in the morning with a cup of hot coffee. They are wonderful warmed over in the microwave for a quick breakfast on the go, too. 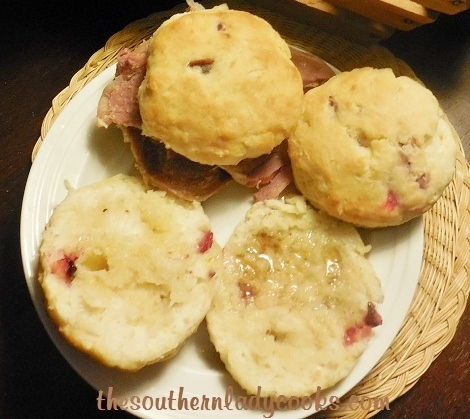 You might like to check out our recipe for 2 ingredient whipped cream biscuits,. They are great slathered with honey and butter as a treat anytime. An easy recipe and a change from the norm. Cook sausage, drain and let cool. Mix together flour, baking powder, and salt with a whisk in a large bowl. Cut in butter until crumbly. Stir in cooled sausage and cheese. Add milk until dough makes a ball without being sticky. Roll out on floured surface. Cut with biscuit cutter or drop onto a sprayed cooking sheet. Bake in preheated 400 degree oven 10 to 15 minutes until done. Makes about two dozen biscuits. Enjoy! Don’t forget to pin sausage cheese biscuits. © The Southern Lady Cooks photos and text – All rights reserved. No copying, posting on other sites, or other uses allowed without written permission of the copyright holder. Feel free to share by clicking on the Facebook, Pinterest or Twitter icons below. You can print by clicking on the green printer icons both above and below every post on this site. Be sure to sign up for our free newsletter to receive new recipes, tips, articles posted to our site. Join 20,000 happy subscribers today. Just look on the right hand side of any page and put in your email address. These sound great I wonder if you could make these with sourdough starter? Or maybe just add the sausage and cheese to your sourdough biscuit recipe? I bet you could make them with the sourdough biscuit recipe. How have I only just found your site???? I think I have just gsined 5 pounds looking at the photos of food here! Can’t wait to try out your recipes! These look amazing, I am making them Friday night, so we can wake up Sat morning and be lazy with no cooking involved!! I truly love your website, they way you cook clicks with how I enjoy cooking!! These look wonderful. I plan on making them over the weekend when everyone will be home. Thanks for sharing.